The Master package includes black Revive sustainable fabric gown with classic front panels and center zipper and oblong sleeves that are open at the wrist. Features include a classic yoke with fluting on shoulders and back with decorative cord and button on the back yoke. 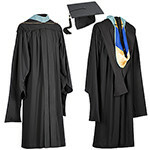 The package includes a deluxe mortarboard quilted cap with black or degree-color tassel, and a classic hood with degree-color velvet and satin lining in school colors.